Jeff Long (in a 2016 photo) led the Arkansas athletic department from 2008-17. LAWRENCE, Kan. — The major reasons the athletic director job at Kansas became available nearly two months ago are precisely the same reasons Jeff Long will be filling that seat beginning Aug. 1. He’s shown a gift for raising money and renovating facilities. He’s shown an ability to lead a Power Five school with fewer resources than its peers to championship heights. And most important, he has a track record as a coach and administrator of fostering success in football. “Those who know him describe him as a fan of character who cares deeply about higher education and the student-athletes he serves,” Kansas chancellor Douglas Girod said in announcing the hiring Thursday. The longtime Arkansas AD signed a five-year, fully guaranteed contract worth $1.5 million annually. Private funding will cover $1.3 million, with the remaining $200,000 paid by the university. Long takes over for Sheahon Zenger, who led the department for seven years before getting fired May 21 for what Girod called “a lack of progress” within the department. Zenger was able to keep the basketball program successful — though in truth, coach Bill Self is the biggest reason for that — and built new facilities for Olympics sports, but he accomplished little else in the areas that matter most. That includes much-needed renovations to Memorial Stadium, the aging eyesore on the north edge of campus, and an even more crucial restoration of its accompanying football program, which has won three games in the last three years. The Jayhawks haven’t had a winning season in a decade, and the two coaches hired by Zenger — Charlie Weis and current coach David Beaty — are a combined 8-55 since 2012. Now, it will be up to Long to determine whether Beaty sticks around past this season, and which direction not only the football program, but the rest of the athletic department is headed. “It was clear from the moment I met with the chancellor and his search committee members, they have a deep love for the university and understand and appreciate the positive role intercollegiate athletics plays in a university community,” said Long, who will be formally introduced next week. Long led the Razorbacks from 2008-17, a period that included 34 conference championships across all sports and the school’s first BCS bowl appearance in football. He also spearheaded a $160 million renovation to the Razorbacks’ football stadium, a task similar to the one he will undertake at Kansas. Zenger had announced plans for a $350 million renovation to Memorial Stadium, but support has been tepid. Long also served as the AD at Pittsburgh and worked in the athletic departments at Oklahoma, Michigan, Virginia Tech and elsewhere. He coached at Duke, Michigan and North Carolina State, giving him experience in every major conference except the Pac-12. He also served as chairman of the inaugural College Football Playoff selection committee. 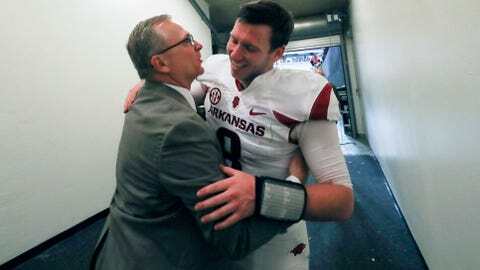 Long was fired in November after the Razorbacks’ football program began to struggle, and after he had lost support of the school’s leadership and influential boosters. But he had been considered a front-runner for the Kansas job from the moment it became open. His hiring was praised by former Secretary of State Condoleezza Rice, who served with Long on the CFP selection committee; Big 12 commissioner Bob Bowlsby, who called him an “excellent addition” to the conference; and Texas Tech athletic director Kirby Hocutt, among others.